2018 Crows debutant Lugg is a member of the Australian Army as a technician electrical. A speedy, outside runner who can deliver under pressure. Lugg’s father Gary played one game for St Kilda in 1979 as a 21-year old before suffering an ACL injury. A premiership player with Swan Districts alongside Crows co-captain Chelsea Randall, Lugg hasn’t played football competitively for the past few years as she focused on her role with the Army. 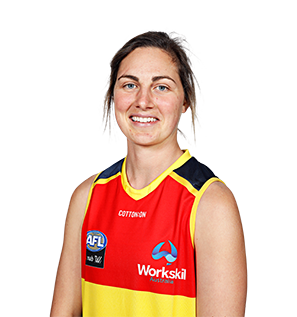 Lugg represented Western Australia four times before going to Adelaide at pick 42 in the 2017 AFLW Draft.